Despite threats and harsh jail terms, Redemptorist News continues to defy government censors. In a church compound in the bustling heart of Ho Chi Minh City, journalists and editors upload the latest online edition of Redemptorist News in a secret backroom bureau. First established in 1935, the Catholic newspaper was shut down by the ruling Communist Party in 1975 after consolidating its control over the country’s once divided northern and southern regions. Redemptorist News was resurrected and re-launched as an online multi-media platform in 2009 by a group of Catholic priests and activists. Their editorial inspiration: to provide news about the church’s activities and social issues, with a special emphasis on the plight of the country’s persecuted Catholic minority, which receives scant, if any, coverage in the state-dominated mainstream media. Redemptorist News is the only local news organization that operates outside of the Communist Party’s strict media controls and editorial diktats. With a staff of six editors and 15 reporters, the small-scale news group uploads a local and English language news site, online radio broadcasts, and a 15-minute daily TV program on YouTube. English language reporting on the site frequently spotlights human rights issues that would be banned in Vietnam’s state-controlled media. In June, Redemptorist News ran a profile story of a Vietnamese Catholic priest who is trying to advance religious freedoms through the use of technology, including evangelism apps for smart phones and tablets. A harder-hitting piece in August reported on the outcry among civil society organisations over the trial of three pro-democracy activists facing alleged charges of anti-state crimes. “We are the voice of the persecuted and poor who have no voice,” said Ly Ngoc Thanh, a Catholic priest and editor-in-chief of Redemptorist News. Many of his news group’s reporters and bloggers have become martyrs for that editorial cause. The group included prominent Redemptorist News blogger Paulus Le Van Son, who was also arrested and detained in August 2011 after trying to cover the appeal trial of a well-known human rights lawyer convicted of anti-state crimes. Ho Duc Hoa, Dang Xuan Dieu, Nong Hung Anh, and Nguyen Van Duyet were the other Redemptorist News contributors or bloggers sentenced that day. Thanh said he was detained by police before the trial to prevent him from attending the reading of the verdict. He said he has been detained and interrogated on three separate occasions, with police authorities ordering him each time to stop reporting on the plight of imprisoned bloggers, their aggrieved and persecuted family members, and other jailed Catholic social activists. The government did not respond to a CPJ request for comment about Thanh’s alleged treatment. Despite the threats and harsh sentences, the media group’s reporters and editors continue to defy those censorship orders. In May, for example, Redemptorist News ran a story quoting the wife of one jailed blogger saying that she would rather be arrested and imprisoned than continue to live apart from her husband. “[Authorities] let us know they didn’t like that one,” Thanh said, recalling the phone call he received after the story’s publication. Official threats often translate into harassment in the field for the group’s reporters. 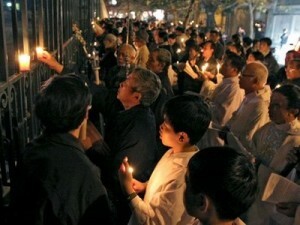 Thanh said that Redemptorist News reporters are often blocked by authorities from entering areas where villagers are locked in land disputes with government agencies. Several of his reporters have had their passports revoked to prevent them from traveling abroad, he added. The Redemptorist News website, www.chuacuuthe.com, has also been targeted by frequent distributed denial of service (DDOS) attacks, an online assault where multiple compromised systems are simultaneously used to access a single computer system, causing it to overload and crash. Thanh said his news site has been bombarded by DDOS attacks as large as one million hits per second, with the anonymous attacks originating from China, Europe, and Vietnam. Thanh believes his hidden news bureau has not yet been raided and shuttered by authorities because they fear the power in numbers of his church’s congregation. “They come around looking but we think they don’t get us because they are afraid of the laypeople in our congregation,” said Thanh, while churchgoers sang early evening hymns nearby.